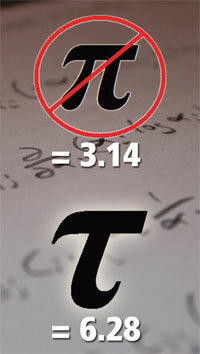 On June 28, the humble pi came under threat from a group of detractors who observed a day to honour what they claim is a more appropriate mathematical constant: tau. Tau proponets say the constant twice as large as pi—or about 6.28, hence the 28 June celebration—makes calculations easier. Not all fans of maths agree, however, and pi’s rich history means it will be a difficult number to unseat. “I like to describe myself as the world’s leading anti-pi propagandist,” says Michael Hartl, former theoretical physicist. “When I say pi is wrong, it does not have any flaws in its definition—it is what you think it is, a ratio of circumference to diameter. But circles are not about diameters, they are about radii; circles are the set of all the points a given distance, a radius, from the centre,” Hartl explained to BBC News. By defining pi in terms of diameter, he says, “what you are really doing is defining it as the ratio of the circumference to twice the radius, and that factor of two haunts you throughout mathematics.” Hartl credits Bob Palais of the University of Utah with first pointing out that “pi is wrong”, in a 2001 article in the Mathematical Intelligencer.